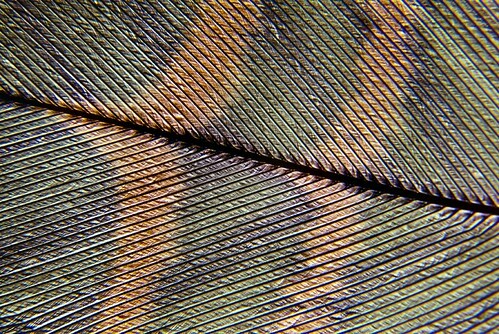 Hawk Feather, photo by Harold Davis. View this photograph larger. Phyllis and I left the kids with Rachel on Sunday and went for a hike in Tilden Park. We found this tail feather (I think it is from a hawk) on one of the ridges. 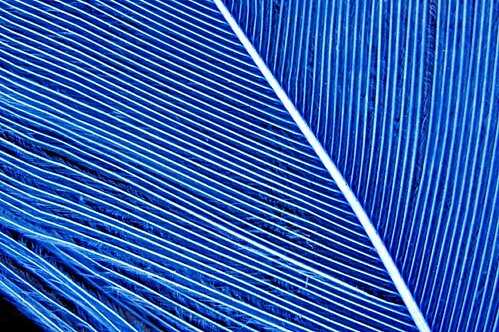 When I brought it home, I beamed light through the feather to bring out its colors and translucency. 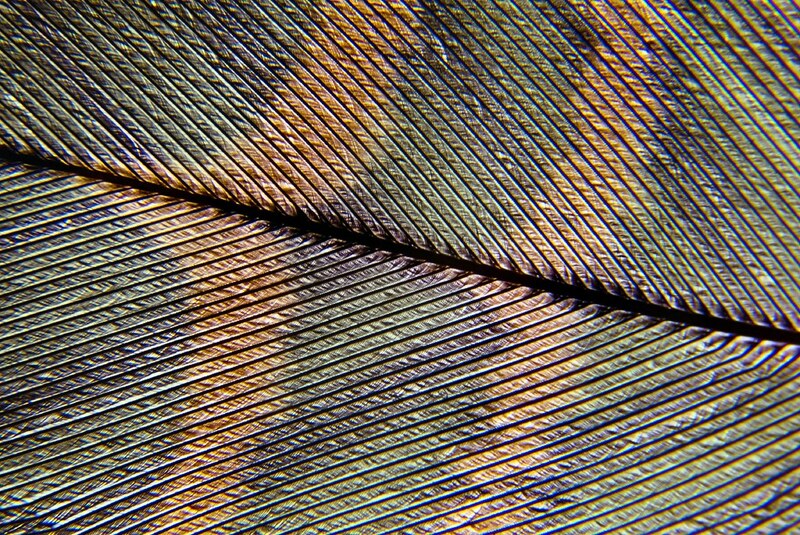 Then I photographed the feather extremely close-up. Web-a-licious, photo by Harold Davis. View this photograph larger. Compositionally, a photograph without a central item of particular interest can work when the photo is about a distinctive pattern. The scale of the pattern doesn’t really matter. 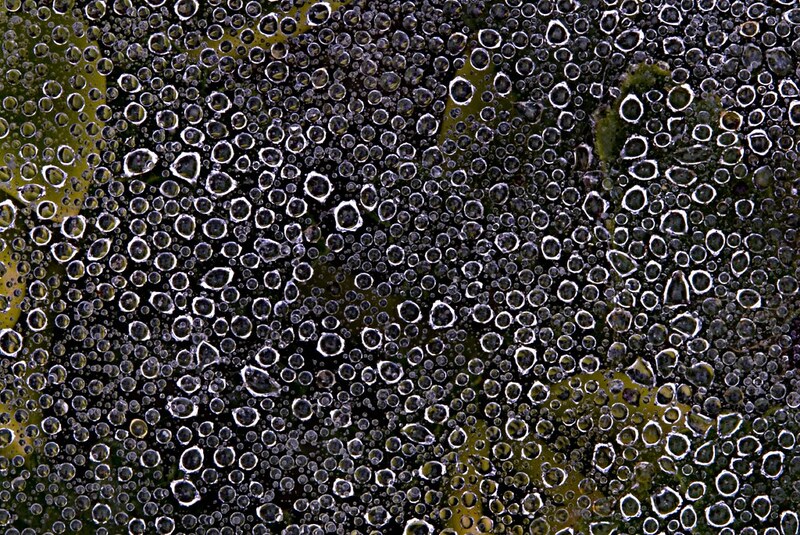 Macro patterns (like the water drops on a spider web above) or trees on a snow-covered cliff in Yosemite’s winter (below) can be interesting. Provided the pattern provides variety as well as homogeneity. 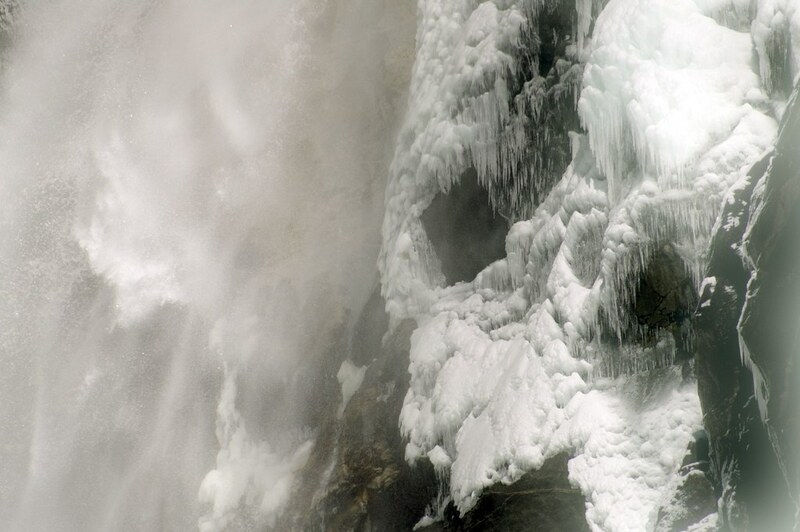 And that the photograph has enough resolution so that the water drops or cliff side can really be scrutinized. 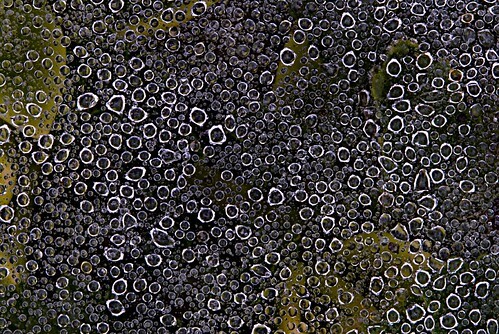 With this kind of photograph, the viewer wants to believe it might be possible to delve into the pattern closer and closer without ever disrupting the suspension of disbelief. Mathew Waking Up, photo by Harold Davis. Mathew was not pleased when I woke him after an hour’s nap by snapping this photo. We’ve been trying to curtail his daytime napping so that we can get more sleep at night. As I’ve noted before, Mathew is a force of nature! Blowing out the candles, photo by Harold Davis. We had a nice little birthday party for Julian, who celebrated his ninth birthday. Everyone was happy, and nobody cried. Which is one of our key birthday party metrics of success. It’s hard to believe that nine years ago Julian was a two-and-a-half pound preemie in the NICU. The time has flown by like no time at all, and we are certainly blessed that he has done so well. 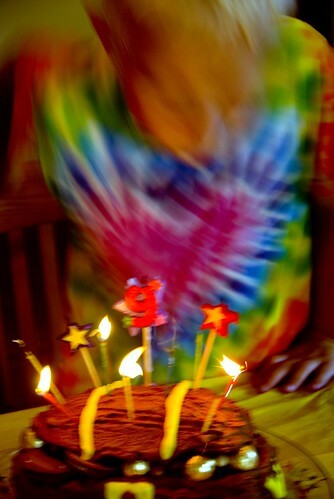 Of course, I took a few photos of showing Julian blowing out his candles with my flash—and they show Julian in focus. But I rather prefer this impressionistic handheld using ambient light to show color and motion. It fits Julian, who is constantly in motion. Check out this photo of Julian chasing wild geese. McClamp Bubble, photo by Harold Davis. View this photograph larger. 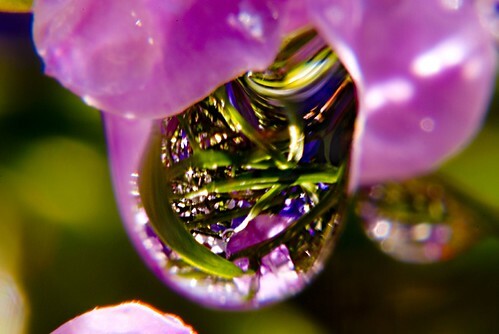 If you’ve been reading my blog, you probably know that about a year ago, I started a series of extreme close-ups of water drops on the flowers in my garden. You can see some of these photos on my blog in my Water Drop category. Of course, one of the main technical challenges with this kind of photography (when I’m using available light rather than a strobe) is the motion of the flower and water drop. A partial answer to this problem is to use my McClamp The Stick (click here for the McClamp website). This piece of equipment keeps flowers from swaying in the breeze using a stake to anchor into the ground, flexible plastic piping, and a padded clamp to hold the flower. If you are really careful, it won’t even damage the flower! 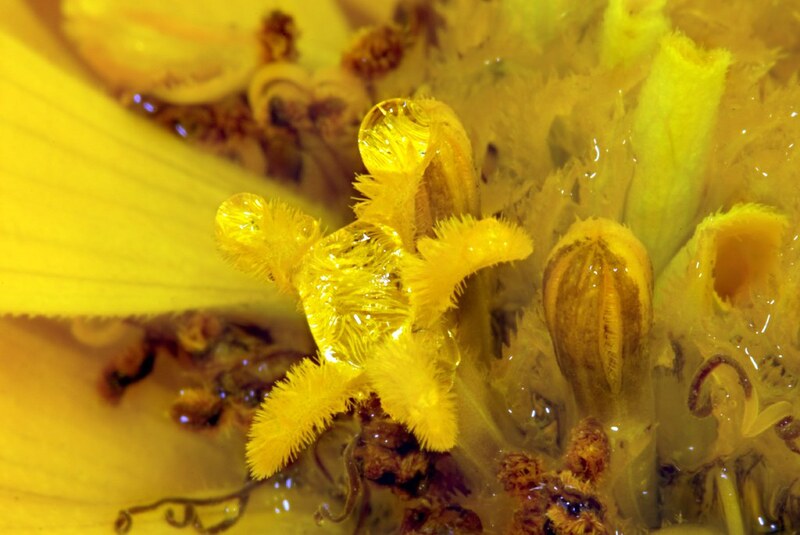 In my photo “McClamp Bubble” (above), I attached the McClamp stick to a dahlia, and after it was attached turned on my irrigation system to get a natural looking set of drops (if I had attached the McClamp after spraying the flower, the drops would gave shaken off). I was pleased to see how sharp this water drop looked when I opened the RAW file on my computer, and amused to see the McClamp stick reflected in it. At first I was going to discard the photo because of of the way you can see The Stick in it. But, “on reflection,” the reflection of The Stick makes the photo more interesting to me (rather than less), because it helps to show within the photo the tools I used to make the photograph. I’m glad I kept it, and I hope you enjoy it! 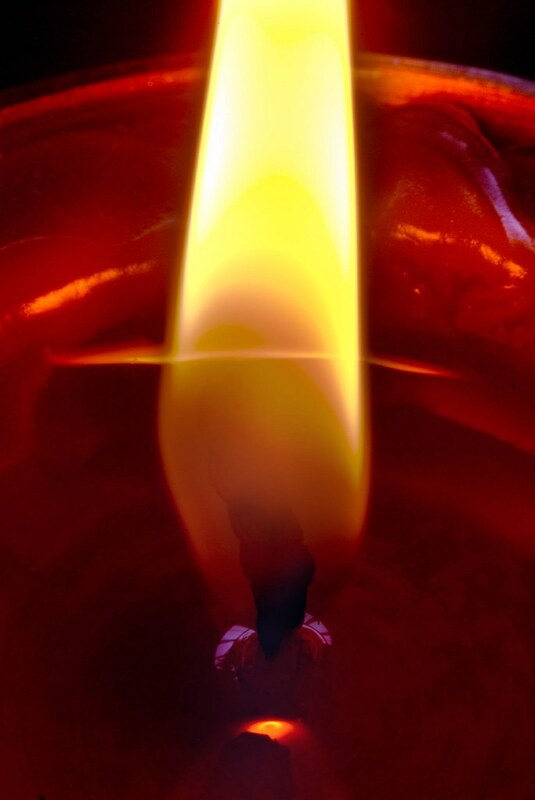 Candle, photo by Harold Davis. View this photograph larger. It was a rare occasion: Phyllis and I were enjoying a quiet, candle-light supper with all kids going down gently. I looked at the candle and the reflection of the flame, and couldn’t resist photography (sometimes Phyllis refers to my camera as the third party in our marriage). You are on your own when it comes to staying wax free. 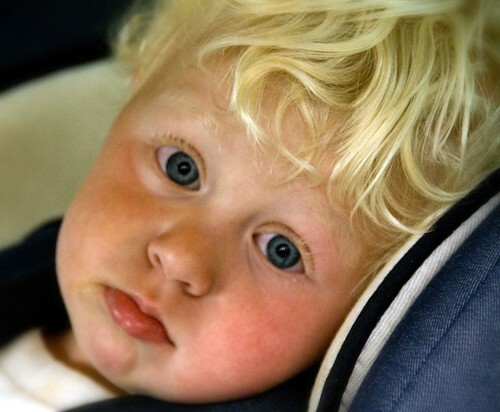 In terms of color temperature, my Nikon D200 set the auto white balance at 3900 degrees Kelvin. For me, this was mush too blue, so I pushed it up to 6900 degress when converting from the RAW. To deal with the exposure range, I opened the RAW image twice, once exposed for the flame and once for the background. One of the RAW images was placed on top of the other as a layer. Next, I used a layer mask and the Photoshop paint brush tool to paint in a nice exposure for the flame from the layer beneath while leaving the background exposure intact. 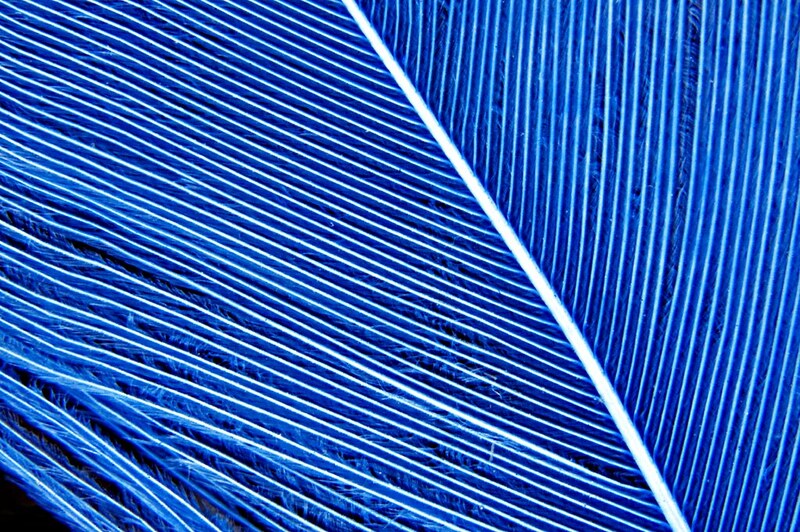 Blue Rail, photo by Harold Davis. View this photograph larger. On our very long drive to Phoenix, Arizona last winter with three young kids in the car, we stopped to play by the railroad tracks. 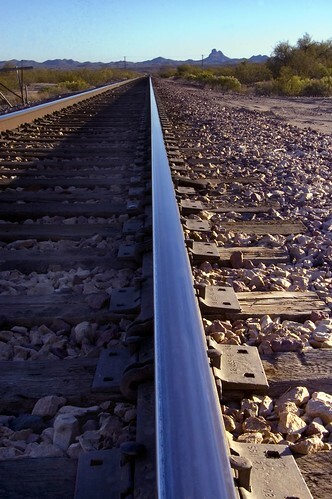 I was struck by the way the blue reflected in the rail extends into the distant horizon, almost meeting the distant blue of the landscape and sky. 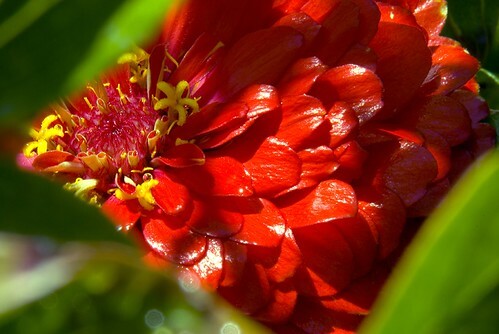 Inner Zinnia, photo by Harold Davis. View this photograph larger. We think of the pleasure of communing with flowers as simple: simple joy in exuberant colors and odors. 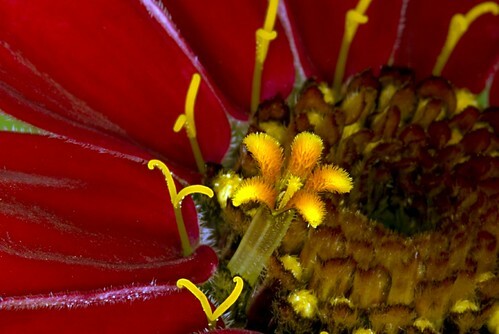 But there’s nothing simple structurally about a flower when you look at the flower closely—as in this photograph of the inner zinnia. 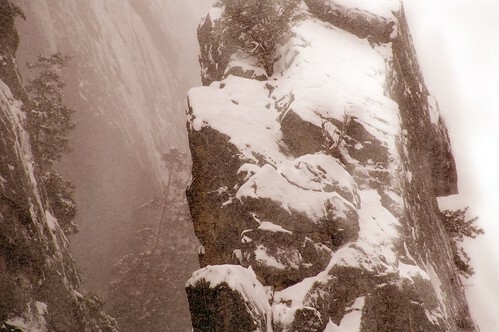 Blizzard in Merced Gorge, photo by Harold Davis. View this photograph larger. Another cool one for the heat of summer! Also, let me call your attention to some very interesting comments about Yosemite’s early human history (see the comments by “Yosemite Indian” at the end of Even the Miwok Names Are Forgotten). Julian Herds Geese, photo by Harold Davis. View this photograph larger. Julian and I were walking in the park at Port Oakland. He loves to chase the wild geese, but he can never (of course) catch them. 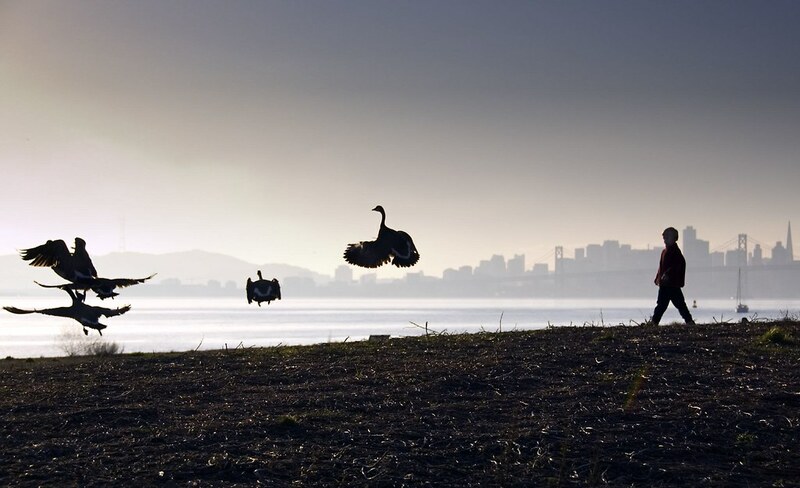 In this capture, the geese are caught in mid air, with the skyline of downtown San Francisco in the background. 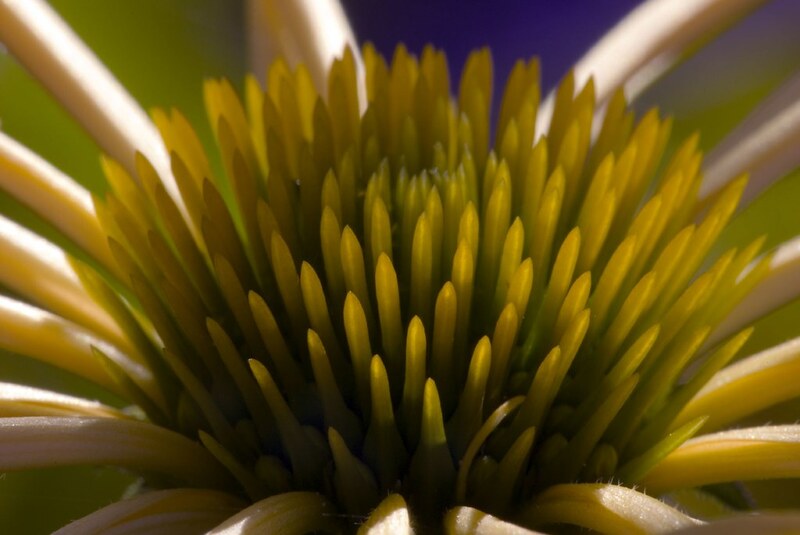 Echinacea Harvest Moon, photo by Harold Davis. View this photograph larger. 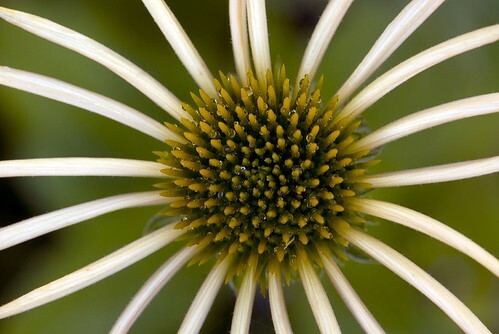 I have been growing echinacea—also called coneflowers—in my garden because they are so spectacular to photograph. This one is the first of my Harvest Moons—a designer flower bred by Richard Saul specifically for its looks. Creating varieties of flowers based on their appearance brings up a number of issues, including the one raised by Michael Pollan in his Botany of Desire: we think we are forming the flowers, but are they really controlling our behavior to their own benefit? This is comparable to wondering whether the beautiful gold digger or the rich old dude gets the better deal. (You can read more about Richard Saul and his beautiful new echinacea varieties here). 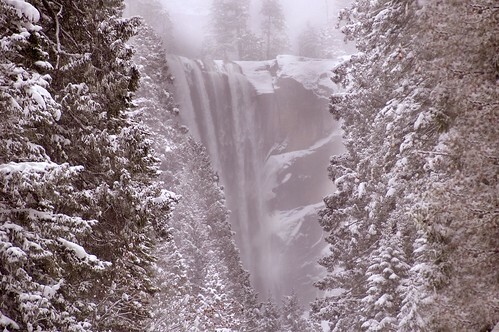 From the Bridge below Vernal Falls, photo by Harold Davis. View this photograph larger. In the heat of the summer, and as the world warms, it is good to remember that winter comes again and that changing weather patterns make for more winter in some places. Yosemite and the Sierras had a particularly heavy snowfall last winter when I took these photos. 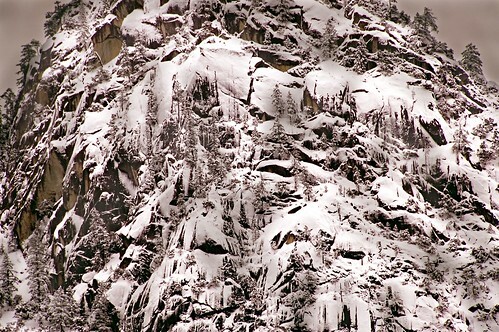 For more pictures of Yosemite in winter check out these posts: Remembrance of Color, Sounds of Serenity, Magical Portals, Winter in Yosemite, Fog Rising, The Trickster, My Myserious Hidden Kingdom, Yosemite Falls from Sentinel Bridge, Yosemite Storm, Entering the Sanctuary, Mysterious, But Where Are the Snows of Yesteryear? Looking at the photo of Vernal Falls (above) and Yosemite Falls (below) in winter makes me feel cold to the bones. How refreshing! Lobelia Drop, photo by Harold Davis. View this photograph larger. This pair of water drop photos reminds me—and Solitaire on Flickr—of stained glass. They were taken first thing in the morning, down as low as possible, with the sun reflecting and refracting on a potted lobelia near our garden bench. I used my 200mm Nikon macro lens, naturally tripod-mounted, along with extension tubes and a +4 diopter close-up filter to get closer. This was one of those photo sessions that mean wiggling on one’s belly and getting covered with water and mud to find the right position. Thank you yoga and stretching exercises, and my kids for restoring my joy in playing with dirt! I’m certainly not beyond cloning things in or out of photos (and I intend to discuss the techniques and ethics involved later in detail), but these are both pretty straight photographs, with only routine processing in Photoshop. 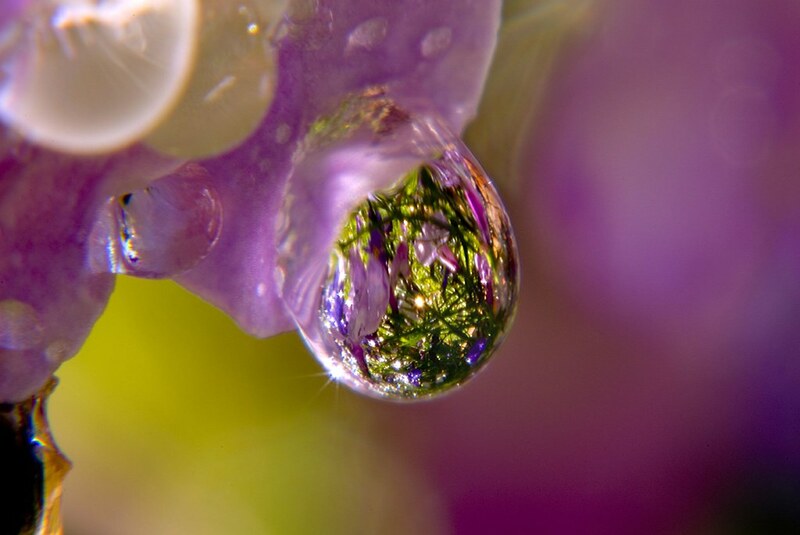 It’s interesting that some water drops are worlds, that one can look down into endless depths (here’s an example)—while others, like this pair, are colorful semi-translucent medallions. 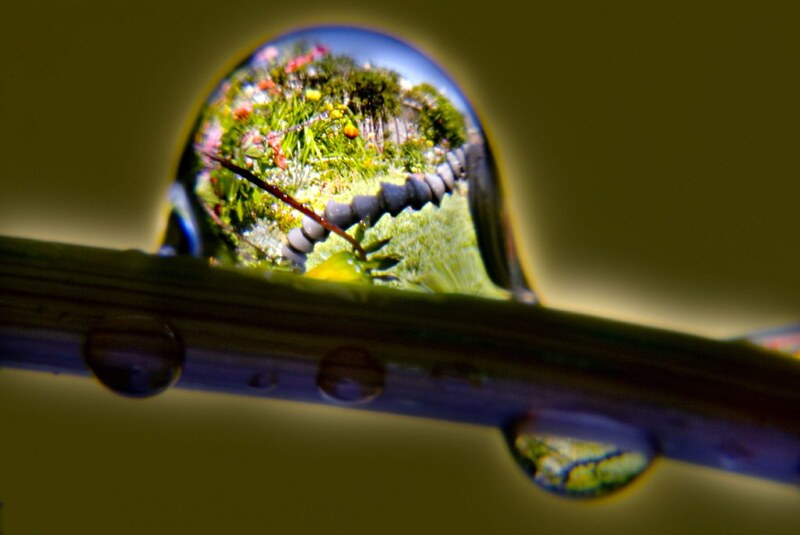 More like nature’s glass-blown jewelry than a trip into alternate realities. 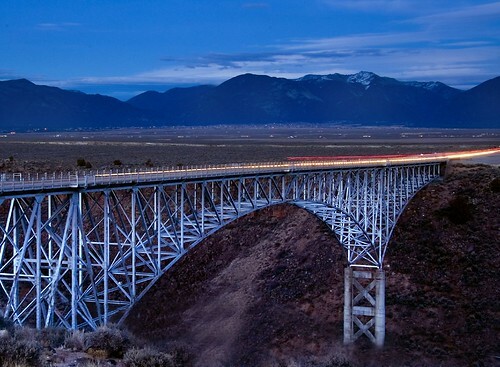 Rio Grande Gorge Bridge, photo by Harold Davis. View this photograph larger. The Rio Grande Gorge Bridge, near Taos New Mexico, is a spectacular place to walk anytime, but particularly at twilight. Five hundred feet long, 650 feet above New Mexico’s Rio Grande river, this delicate steel structure, built in 1966, vibrates with every passing car. Here’s a view looking down the river gorge from one of the “balconies” in the center of the bridge. After spending some time photographing from the bridge (and many of my photos were spoiled because vibrations rendered my use of a tripod futile), I decided to photograph the bridge itself. I stationed myself on the lookout beside the rest area on the west side of the bridge. It was getting too dark to take a normal photo of the bridge, so I decided to wait for cars so I could capture the headlights and tailights in motion on the bridge. You may have to view the photo larger to really see this. This kind of exposure is always one part guesstimation, no matter how fancy the equipment one uses. With the camera on tripod, I tried a number of exposures with differing shutter speeds. I tried to time it so the car would cross a good portion of the bridge during the exposure, but this timing was a bit tricky—because the behavior of the cars on the bridge, pretty naturally, was unpredicatble. Often, they slowed down on the bridge either to take in the view, or to be safe. And there wasn’t much traffic, in any case. This exposure was at 20 seconds and f/16. Not seen in the final image, a high fence to protect tourists from themselves and the Rio Grande gorge, covering the lower portion of the photo. I cloned it out in Photoshop, and also double-processed the RAW file to expose for the sky and the bridge. How big is my garden? Escapade, photo by Harold Davis. View this photograph larger. I get asked often, “How big is your garden?” With all my photos of flowers, some people assume I have a large garden, and this is not in fact the case. Although even maintaining the smallish, rather urban garden we have is a stretch—a joyful stretch—along with taking care of the three boys, photography, and the rest of life. Actually, I am tempted to answer the question about the size of my garden in biblical terms: to mutilate John 14:2, around my Father’s house there are many gardens. 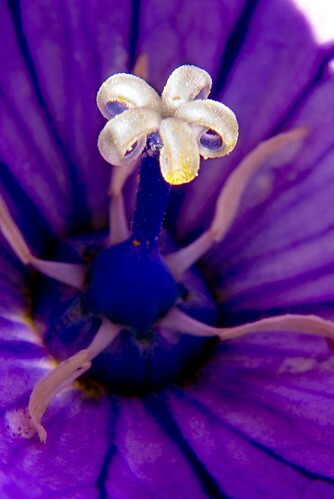 My garden is dense, with enough to keep me excited about macro flower photography. A kind of large container garden on about 1/3 of an acre. The fruits and vegetables are in raised beds along the narrow, protected southwestern exposure. The northeastern passage is a path between the house and street, too narrow really to be called a garden, but beautiful in in a secret garden kind of way. The backyard is more-or-less consigned to the kids, their play structures, and vehicles. I garden to photograph. Only the front garden behind its curved fence is truly mine: I plant poppies, dahlias, roses, echinacea, leucospermum, hellebores—whatever I want to photograph. My garden has the virtue that it is mine: if I want to put a tripod leg somewhere, clamp a plant, or even cut a flower for studio photography, there is no one to stop me. “Are all your flower photographs of your own garden?” No, there are many gardens surrounding my Father’s house. Some days, when I have the time, I like to mount my equipment in my pack, tripod on the outside, and head for a good flower photography destination. Very locally, and not in preferential order, Annie’s, Berkeley Hort, Blake Garden, and the UC Berkeley Botannical Garden. 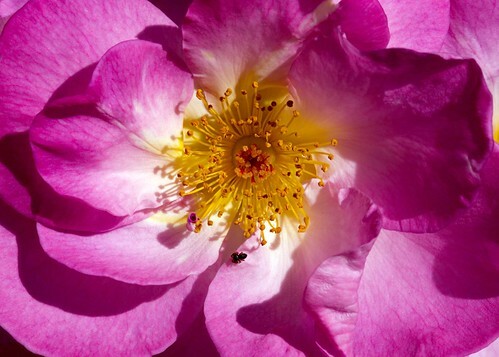 I took the photograph of the Escapade Rose (with a little spider) the other day at the municipal Berkeley Rose Garden.